Life Insurance Corporation of India (LIC) has issued a recruitment notification to recruit LIC AAO (Assistant Administrative Officer) posts. It’s really good news for who is waiting for Govt jobs, LIC AAO Jobs. Candidates who are completed Graduate they can apply online mode by visiting official site of LIC before last date. Below are the details of LIC AAO Recruitment 2016, how to Apply, Recruitment Process, Previous Question Papers, LIC AAO Solved Question Papers, old/last year question papers of LIC AAO and more are given below. Candidates who are preparing for LIC AAO Posts they must and should check previous question papers/ Solved Question Papers, Exam Papers, Model/ Sample Question Papers for better results in the Online Test. 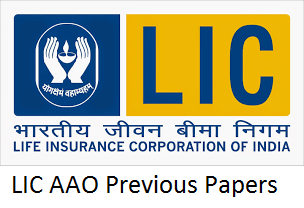 Below are LIC AAO Solved Question papers Last 5 years Question Papers. You can download from your smart mobile also with single click.